Underground pipelines in local and district heating networks as well as district cooling systems harbour risks: They can suffer from manufacturing faults, can experience wear and tear due to movement caused by expansion and contraction, and can become damaged during installation or underground construction work. This always causes the same result: leakages. To detect damage early on, and thus avoid costly repairs, pipelines should be monitored for leaks automatically at all times. The resistance locating process with NiCr system technology developed by BRANDES specifically for plastic casing pipes helps to prevent damage: It identifies moisture in the pipework insulation incomparably early on, can locate it precisely and automatically sends a report to the central monitoring unit. BRANDES has always set the technological benchmarks in the industry. A recent example of this is IntCon, which stands for integrity and consistency of measurement results – an unerring tool for monitoring system security. Graded solutions are available to monitor heating and cooling networks of different sizes and with varying monitoring needs. With the so-called “Nordic system” for leak detection in plastic casing pipes, uninsulated copper wires are integrated into the insulation material. These are then used for the detection of escaping moisture. This technique – which is still used today – was developed more than 50 years ago. It has significantly differing measurement properties which are only reproducible with restrictions depending on the supplier and batch. To ensure that the “Nordic system” meets the stringent BRANDES quality requirements, special route computers and central units for leak detection were developed. The so-called “Hierarchical systems” are made up of up to four monitoring levels (hierarchies). A hierarchical system is able to detect leaks centrally, but the defects must be located manually at each level. 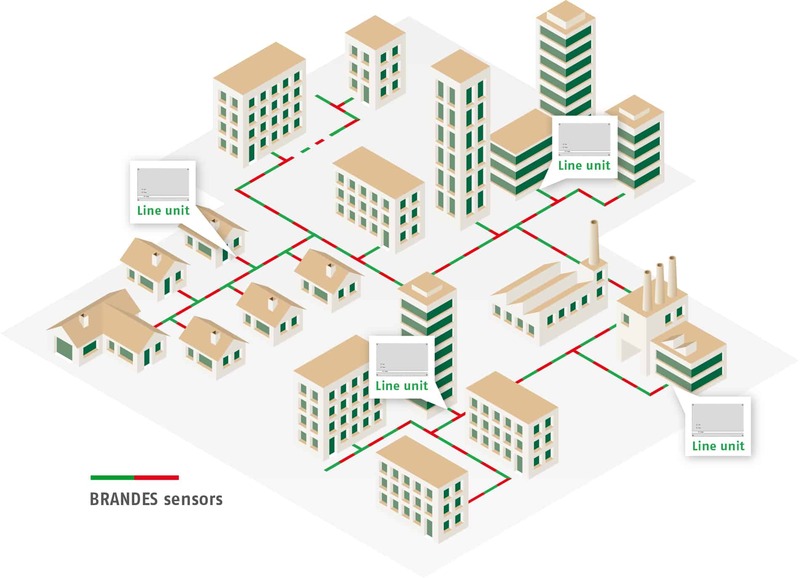 To meet the demands of many network providers, BRANDES therefore developed the “T-system” to secure plant operations fully automatically. In addition to allowing the whole system to be monitored centrally, all branches (hierarchies) can be checked for leaks and pipe breaks in a targeted way. This means that manual control measurements are no longer required. Defects are reported precisely to the district or street. Solution concepts from BRANDES for networks in combinations of NiCr and copper loops have been successful in the district heat market for many years.